This is a sponsored post and it contains affiliate links. Please read this blog’s disclosure post for more info. Shopping for clothing, accessories, shoes, et al on Amazon is one one of my favorite past-times. Yet I feel like many of my shopping buddies are missing out because it can be overwhelming to shop Amazon Fashion! I’m all about finding good deals online and Amazon has thousands of them, especially on everything you want to create a beautiful outfit. This post is devoted to teaching you how to shop Amazon Fashion like a pro. We’ll discuss ways to easily narrow down and sort your searches, how to find great deals and then we’ll end the post with 40+ of my favorite picks: 35 of which are under $100, and 25+ of which are under $50. 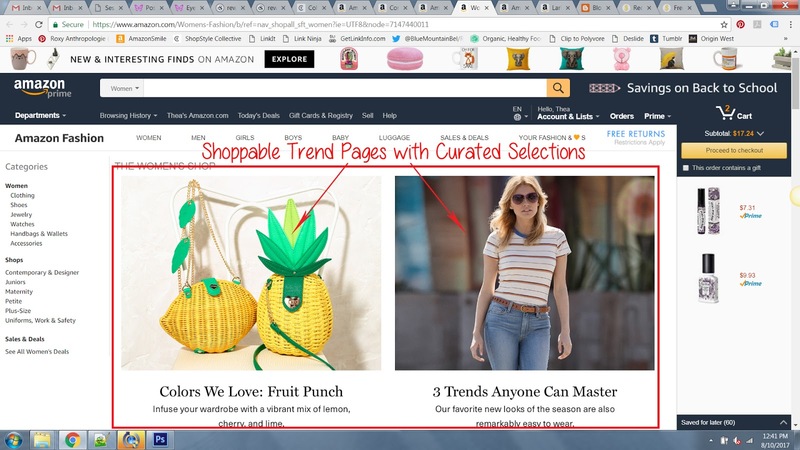 The first thing I want to mention is that when you go to the Women’s Fashion homepage in Amazon Fashion, there are always curated boutiques to look through (shown boxed in red in the image above). So if you’re not sure what you’re looking for, just want to browse or see what’s popular and featured right now, this is the page to start with. Just like any retailer, you can also browse by categories (i.e. Clothing, Shoes, Jewelry, etc.). On the left side of the screenshot above you might notice a link called “See All Women’s Deals.” If you are a price-conscious shopper this is an awesome way to immediately filter your results down the least expensive items. It’s not unusual to find designer clothing mixed into this section! …and gets tons of results. 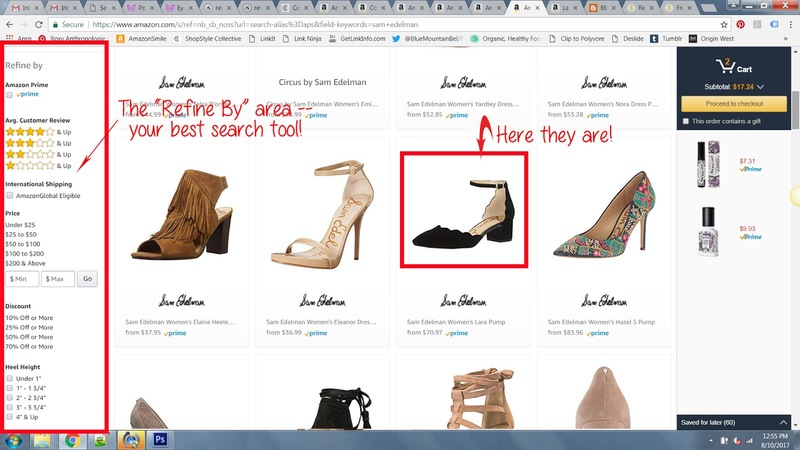 If you’re like me you may want to scroll through the results because I like to see what’s available from my favorite brands anyway, but if you’re looking to save time or find the heels faster, the ‘Refine By’ box highlighted in red in the image above is so helpful! You can refine by nearly any criteria. For this search I selected “brown” from the color options so I could find the heels faster — and they are boxed in red in the results of the screenshot above, the Lara Pump ($71-$120). – ★★★★☆ & Up reviews, because I feel better about buying stuff that’s been reviewed and liked by other customers. These refinements are super helpful for eliminating items that can’t be shipped Prime, that either haven’t been reviewed yet or are getting mixed to poor reviews, and helps me stay on budget by setting the exact prices I want my results to be between. I also enjoy using the “Discount” refinements when hunting for sale items. The “Top Brands” filter will help constrain your results to nationally known brands. Another great way to narrow down your searches is to use descriptive words for what you want to find. For example terms like “wrap top” instead of just “top” are good for limiting search results, “fit and flare dress” is better than “dress” and so on. Give as much detail in you can in your searches, from brand (if you know the brand you want) to style of item (i.e. crossbody, tote, or hobo for handbags for example) to color to type of item. This helps to narrow down results quite a bit, helping you find what you want faster. Amazon’s getting ready to launch a very cool new feature soon, one that made me very excited to sign up as a founding partner in their Fashion Influencer program!! This new upcoming program is called Prime Wardrobe. In this very much needed try before you buy program, you fill up a box with 3+ items, try the items on at home (for up to 7 days) and then return what you don’t want. This is a complete godsend for online shopping! How many times have we ordered items that should fit us perfectly only to discover that they don’t fit at all, and get charged return shipping? In the Prime Wardrobe program you can get up to 20% off your order, and returns are free within the 7 day return shipping window. As a Fashion Influencer member I’ve already been able to try the program and I love it! It makes choosing and trying items hassle free. Prime Wardrobe is for Amazon Prime members — you can sign up here to get notified when the service has launched, and if you’re not a Prime member yet you can sign up here. I’ve rounded up a bunch of my recent Amazon Fashion favorites below, many of which are under $50. Click here to see a zoomable version of this photo. You can click on the photo to make it larger. I went for highly-rated items wherever I could. I’ve noticed that with the right search terms you can find many tops that other retailers are selling for over $100 for much, much less on Amazon. I’ve also had great luck finding tops like my favorite retailers used to sell that they seem to have abandoned. My closet is very happy! Look for some of these items in upcoming OOTDs. What tips do you have for shopping on Amazon? What clothing/shoe/accessory buys have you made there lately? You can see all my recent posts about Amazon, including shoe deals galore and luxury denim starting under $30 via this link. Next Post The work shoes your closet (and feet) will thank you for! Thanks! I was just thinking about this because shopping on Amazon can be overwhelming, but they do have some great designers for less. These are some great tips. I like the idea of the Amazon Wardrobe program too! Thanks Shannonykc! I am very excited for the public unveiling of the Prime Wardrobe feature. I know quite a few people trying bento boxes like MM Lafleur so this is a great alternative. I always love a bargain so I would prefer brands vs. a non brand that I am not familiar with (and there is also actually going to a store and if one is willing to drop some cash for some theory or ted baker items, you generally can find someone to assist you). Thank you so much, Roxy, for de-mystifying shopping on Amazon Fashion–and, for curating such cute picks! This is so helpful! So many good pieces! amazon is such a fashion spot!! I totally need to start shopping on amazon! if for nothing else, then the 2 day shipping! This post is incredibly helpful, Roxy! I totally need to adopt your search suggestions to avoid getting overwhelmed! And, I love all of your picks! This is SO helpful & the Prime Wardrobe feature sounds amazing! So many great items! Thanks for sharing. I've heard about this and it sounds awesome! Can't wait to try this service. I have not tried Amazon Fashion yet but I definitely want to after this post!!! This is seriously such a helpful post!! I haven't tried Amazon Fashion but definitely want to check it out! Shopping on Amazon is dangerous because of how convenient and easy it is! They always have the best fashion finds! Wow such great information!! Thanks!! Shopping on Amazon is definitely overwhelming sometimes because of the unlimited choices. I love how you broke it all down! Amazon has seriously stepped up their fashion game! It's been such a great resource when things are sold out at other places! This was a really helpful post to read. I've been shopping more frequently in the fashion department of Amazon, but I'm always curious what the quality is going to be like if it isn't a brand I'm already familiar with! I'm excited for their try-on program. So exciting! Amazon has so many great finds!! Such a helpful post! Need to check out Amazon fashion more!! So many great finds, I love shopping Amazon for clothing, the shipping and rates are amazing! Prime Wardrobe sounds like my new best friend! Can't wait to try it! That 5th dress! I die!! love (22) and youre right, anthro used to have tops like this! i used to shop quite a bit from myhabit (esp when they had byron lars!) anyways ill have to look into the amazon fashion..seems like there are some good options! Great tips! I tend to check Amazon when my favorite designers are sold out elsewhere. I've found cute Eva Franco dresses there. I purchased the bamboo bag there. Great quality if anyone is interested!